How crazy is too crazy to make a will? Would I? Would I ever! I mean, hey, how many times do you get to consider the issue of just how crazy you have to be, to be considered too crazy? That’s why we see that introductory language in wills that the person is “of sound mind” or “of sound mind and memory” or, in the case of Mason Lee, “of perfect mind, memory, and understanding.”3 If the person isn’t of sound mind — if he’s non compos mentis4 — then the will won’t hold up. So… just how crazy do you have to be, to be too crazy to make a valid will? 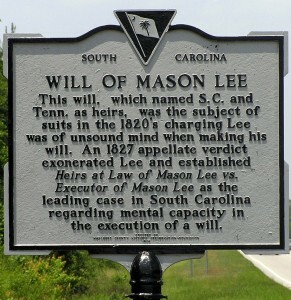 That was the question a South Carolina jury had to contend with in Mason Lee’s case, which reached the South Carolina Court of Appeals in the January term of 1827. And the answer, in a nutshell, according to this case, is: really, really crazy. In fact, you can go ahead and be really, really crazy if you’d like — as long as you’re not really, really crazy on the exact day and at the exact time when you sign the will. Now this is all nothing unusual, right? People leave their estates to non-family members all the time — to charity, to homes for stray cats, even to their dogs. So what was the big deal here? In other words, as long as you’re not really really crazy when you sign your will, you can go ahead and be as crazy as you want the rest of the time. 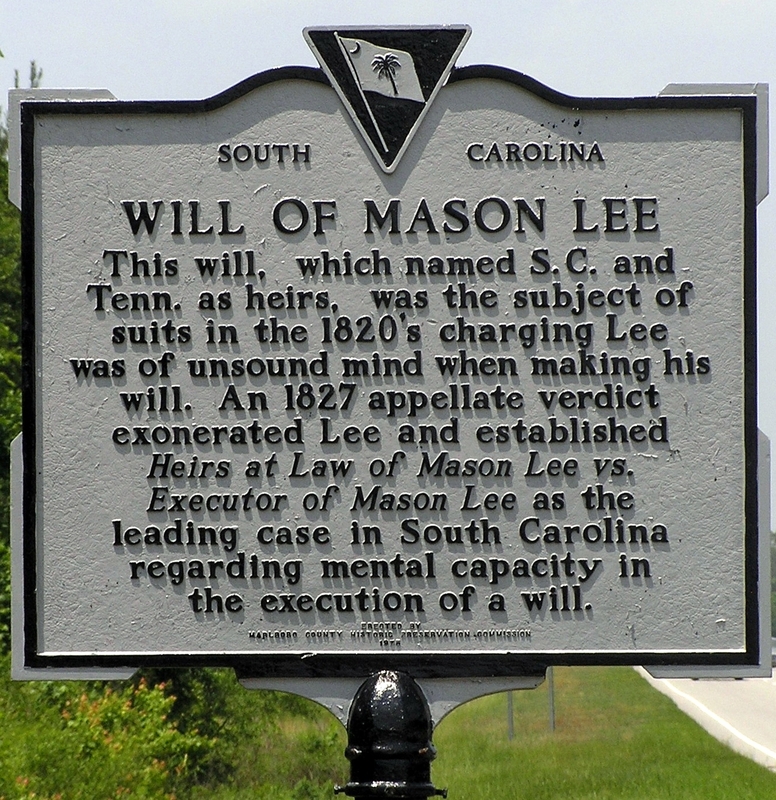 Mason Lee’s grave itself is in the old Brownsville Church Cemetery in Marlboro County, South Carolina.30 And with so much of his estate having passed into the hands of the Wiggins relations, you just have to believe he’s there spinning in it even today. You always have such captivating stores. Who knew law could be so interesting? No, I think it’s just your writing that makes it interesting. Keep up the great stores. Thanks for the kind words, Tina, but there are a LOT of cases that are this interesting. Really!